Chaikin’s Volatility indicator compares the spread between a security’s high and low prices. It quantifies volatility as a widening of the range between the high and the low price. There are two ways to interpret this measure of volatility. One method assumes that market tops are generally accompanied by increased volatility (as investors get nervous and indecisive) and that the latter stages of a market bottom are generally accompanied by decreased volatility (as investors get bored). Another method (Mr. Chaikin’s) assumes that an increase in the Volatility indicator over a relatively short time period indicates that a bottom is near (e.g., a panic sell-off) and that a decrease in volatility over a longer time period indicates an approaching top (e.g., a mature bull market). As with almost all experienced investors, Mr. Chaikin recommends that you do not rely on any one indicator. He suggests using a moving average penetration or trading band system to confirm this (or any) indicator. 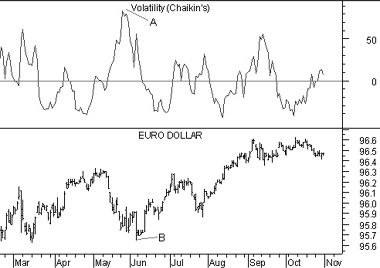 The following chart shows the Eurodollar and Chaikin’s Volatility indicator. The indicator reached a rapid peak following a panic sell-off (point “A”). This indicated that a bottom was near (point “B”). Chaikin’s Volatility is calculated by first calculating an exponential moving average of the difference between the daily high and low prices. Chaikin recommends a 10-day moving average. Next, calculate the percent that this moving average has changed over a specified time period. Chaikin again recommends 10 days.